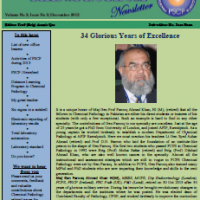 It is a unique honor of Maj Gen Prof Farooq Ahmad Khan, HI (M), (retired) that all the fellows in Chemical Pathology in Pakistan are either his direct students or trainees of his students (with only a few exceptions). Such an example is hard to find in any other specialty. The contributions of Gen Farooq to our specialty are countless. Just at the age of 25 years he got a PhD from University of London, and joined AFIP, Rawalpindi. As a young captain he worked tirelessly to establish a modern Department of Chemical Pathology at AFIP Rawalpindi. Here we must mention his teachers Lt Gen Syed Azhar Ahmad (retired) and Prof D.N. Barron who laid the foundation of an institute-like person in the shape of Gen Farooq. His first two students who passed FCPS in Chemical Pathology in 1992 were Brig (Prof) Abdus Sattar (retired) and Brig (Prof) Dilshad Ahmad Khan, who are also well known names in the specialty. Almost all the instructional and assessment strategies which are still in vogue in FCPS Chemical Pathology were set by Gen Farooq. In addition to FCPS, Gen Farooq also trained many MPhil and PhD students who are now imparting their knowledge and skills to the next generation. Maj Gen Farooq Ahmad Khan HI(M), MBBS, MCPS, Dip Endocrinology (London), FCPS, FRCP (Ireland), FRC Path (UK), PhD (Lond), retired on 30 Oct 2013 after 34 years of glorious military service. During his tenure he brought revolutionary changes in the departments and the institutes where he was posted. He was elected dean of Combined Faculty of Pathology, CPSP, and worked tirelessly to improve the curriculum of FCPS of all disciplines of Pathology. Recently he has been elected as President of Pakistan College of Pathologists by a majority vote and he is currently working on this post. Last but most important for us, he was the founder President of PSCP. We hope his retirement just envisages a change of pattern of his dress; otherwise he will be available for all professional activities to us. We pray a long, prosper and healthy life for him and his family.